Do any of you remember Shelly Hack??? 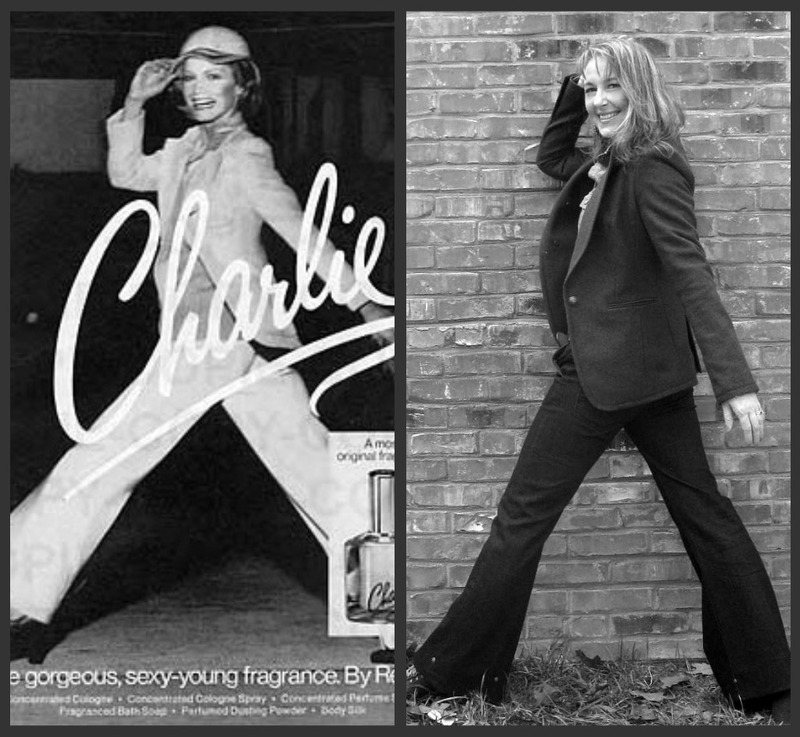 She was the face of Charlie perfume. My grandmother adored that perfume and I am pretty sure she gave a bottle to each of her granddaughters. The face of Charlie was Shelly Hack. She was also briefly an Angel on Charlie's Angels. This outfit made me think of her today as I was getting dressed. sadly I didn't have a cool hat to wear. the bell-bottoms and blazer with the button shirt are spot on! I even have on some macrame jewelry! I don't know about you, but I am going to be loving all the 70's fashions that are out there for the spring. Are you feelin' the funk too?? I like the flared jeans! I too am loving all the 70's fashion. I think that side by side pick is amazing. I remember her. And all those ads. 1. I don't know how the headbands stay on. I guess I have the right shaped head? 2. I would love to shop for shoes with you. How much fun would that be? 3. On El Vintage, she has measurements for all the clothes so it's easy to tell which ones would fit. I love the comparison to Shelley Hack!! I haven't thought of her in ages! My opinion is...you are way cuter! Flares AND a denim shirt....LOVE love love this look from top to bottom! I love that first picture- its almost like you're her shadow! I am loving flared jeans- my next purchase for sure- you are looking great! Absolutely. And love those pants you're wearing. You have the stride down pat! I'm loving the 70s silhouettes myself. So fun and flattering I think. I have a picture of my sister from 1978, going off on a trip in a suit that looks a lot like that. I went to school in Iowa and spent most of my time in Levi 501s. And I think your modelling skillz are perfection. You pulled off her pose beautifully. Who needs the hat? Love it, I love how you posed in the same way. Classic. The jean on jean is heaven. Looks great. great inspiration and i love the denim on demin look! Oh my gosh, before I even noticed the Charlie ad on the left..I thought you looked like the Charlie girl. I sure did love that perfume back then. You are totally pulling off that look.